What is Genesis Apologetics doing to equip students? If you have explored our website for any length of time, you know that our passion is to educate parents and students to understand and respond biblically to evolutionary teachings in public school textbooks. It is our goal to see young people strengthened in their faith in God’s Word, that they may know and love their Creator, and be prepared to respond to attacks on the truth and authority of the Bible. 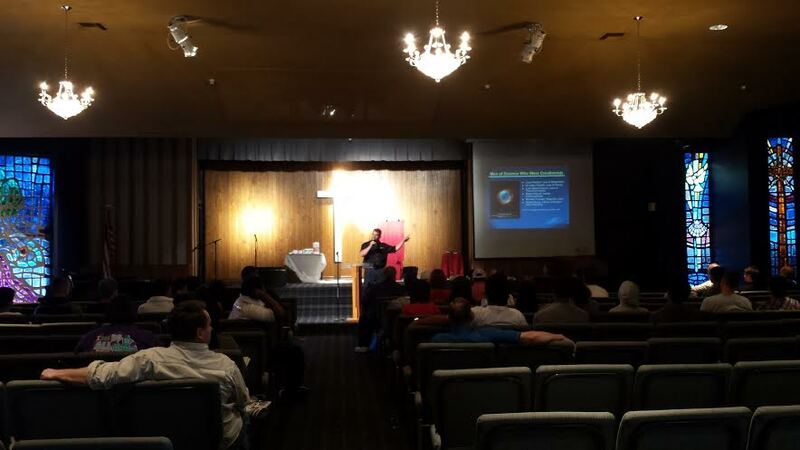 Genesis Apologetics speaker Dave Bisbee presenting to a group of students on refuting evolution. Website – Our website provides hours of free training on creation apologetics, providing basic information to refute the main tenets of evolutionary teaching. The materials we use include short video clips, video presentations, regular blog posts, downloadable ‘fast facts’ sheets, and short points to rebut each of the major topics covered in 6th, 7th, and 10th grade California textbooks. Facebook – Our Facebook page has reached thousands of people in Northern California, many who would otherwise never hear about the evidence for creation and the Flood. God has allowed many of our posts to ‘go viral,’ often reaching thousands of local users in only a few hours. Distributing Materials – Since our ministry began last year, we have distributed thousands of books, booklets, and DVDs to parents, Christian teachers, students, pastors, and youth pastors in the Northern California area. Trade-Show Booths – We have held booths at many Christian events around the state, where we have had the opportunity to minister to hundreds of people with the message of biblical creation and the importance of training students in the book of Genesis and in creation apologetics. Seminars and Presentations at Churches and Schools – God has allowed the ministry of Genesis Apologetics to give presentations at some of the area’s largest Christian schools and churches on topics ranging from the evidence for Noah’s Flood to the fossils of so-called ‘ape men’ like Lucy and the Neanderthals. We are currently raising money towards our $60,000 goal to fund our strategic plan for reaching every youth pastor in the state of California (mid- to large-sized churches). Your donations are appreciated! What has been the effect of this ministry? We have received testimonies and feedback from many who have attended our seminars and read our materials, saying that God has used creation information to strengthen their faith and give them boldness and confidence in the Bible as the true history of the universe. However, we have also heard from pastors and church leaders who have told us how much this information is needed in churches and schools. We have also heard from concerned parents who have told us how much they wished that their ‘prodigal’ son or daughter had been exposed to this message before they left the home. Pray – We recognize that we can do nothing without God’s empowering and opening doors to minister. Pray that God will continue to give us opportunities to minister, and that He will grant us victory. Pray also that God will continue to use our materials to reach those in our local area. Share our Materials – Like our Facebook page, share our posts and materials, invite your friends and family to our upcoming events, or recommend our website to your pastors, youth pastors, Christian school teachers, or church leaders. Host a Presentation – Visit our “Request a Presentation” page and sign up to host a free Genesis Apologetics seminar with one or more of our speakers. We will bring props to the presentation, along with free materials for distribution. Thank you for reading, and be sure to check back regularly for new posts! Also, be sure to register for our upcoming 3-week training seminar in El Dorado Hills! This entry was posted in Uncategorized on May 4, 2015 by caleblepore.